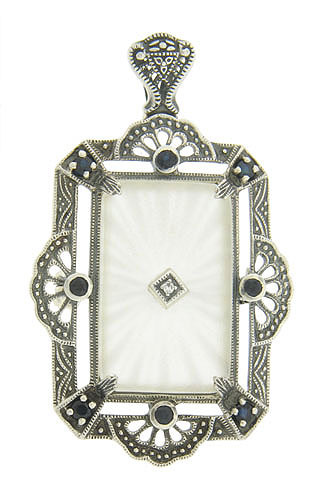 A rectangular piece of Austrian crystal is set in this lovely filigree pendant/pin. The antique style pendant is adorned with deep blue sapphires, while a sparkling diamond is set into the center. 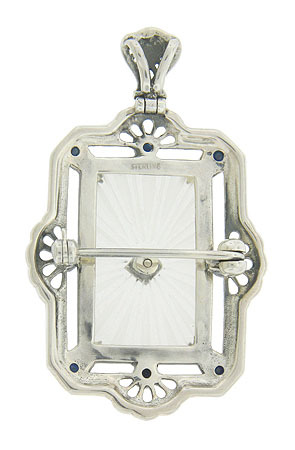 This romantic pendant is crafted of sterling silver and measures 1 1/2" in height by 1 1/8" in width. The pendant is a graceful addition to any bride or bridesmaid wardrobe. The beautiful piece is fashioned with a pin on its reverse side and functions as a pin or pendant.